and for that, I figured out what should I eat and drink in a day. The life-changing solution to losing weight and that can make your new year's resolution a reality. And so, today I am sharing with you my secret recipe for effective weight loss. This recipe needs no fancy ingredients, everything mentioned in the ingredients list is easily available ingredients in your fridge. So give a try to this easy, excellent weight loss salad, flavored with lemon and tahini dressing. 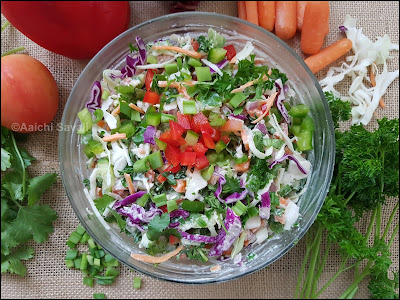 This nutrient filled vegan, gluten-free and detox salad made with green leafy vegetables. It helps the body to detox and gets nourished at the same time. So the key to weight loss is actually consumption of foods which are low in calories and high in fiber and burn calories by doing exercise. When you fill up on low-calorie foods, your overall calorie intake goes down; as a result, you lose weight over time. Your diet should be a combination of all healthy foods which together make up for your nutritional requirements. Also, this salad goes well with the potatoes, stir-fried veggies, boiled eggs or virtually with any meal. It's a miraculous and wonderful source of food for weight watchers. It is loaded with fibers, antioxidants, and vitamins. 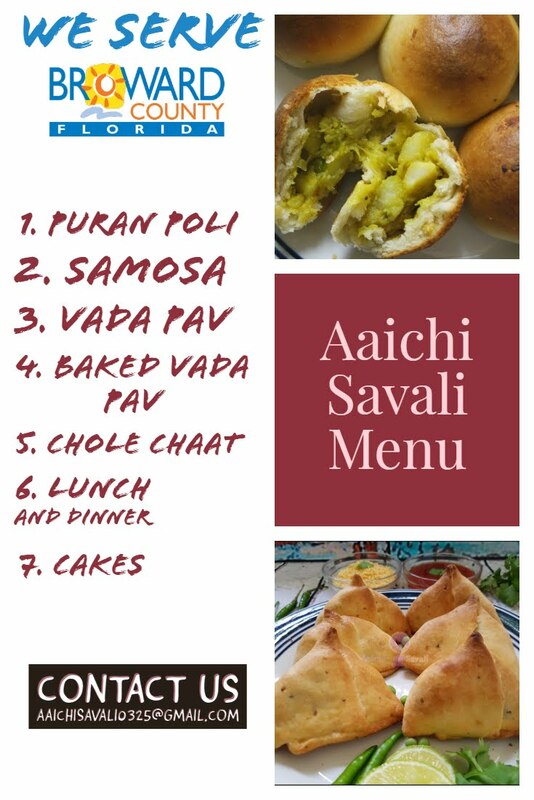 Finally, I have found this recipe and now sharing with you all. Ever thought that a yummy salad can be one of the best ways to shed that extra flab? Well, yes you can actually lose weight with this amazingly easy recipe for losing weight. 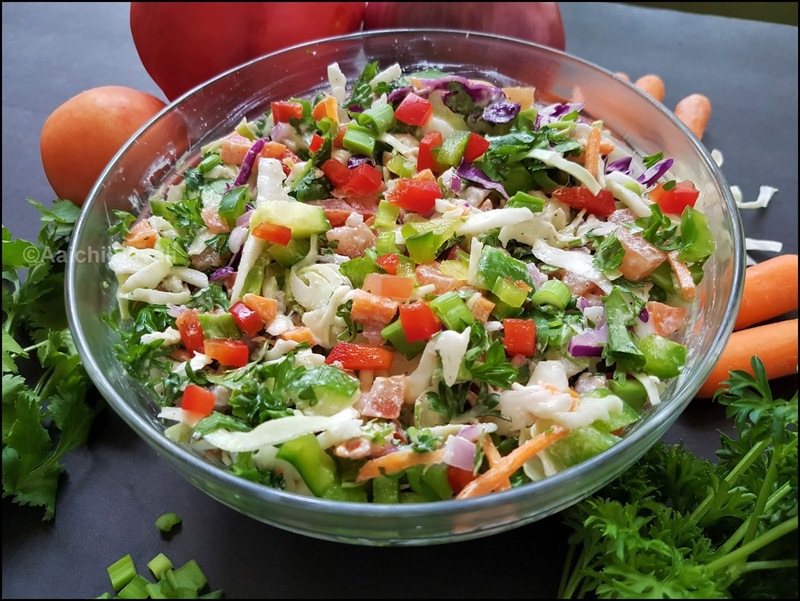 This salad is a tried and tasted recipe which shows positive results if taken regularly. 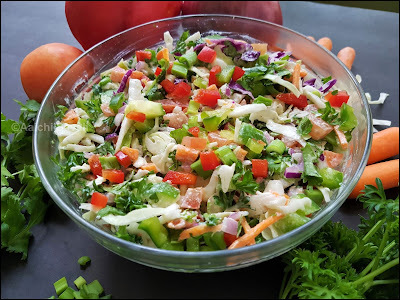 The secret of this salad is, it fastens the metabolic rate and thus helps you lose weight consistently. It can help you trim down by stimulating your metabolism, turning off belly fat genes and frying flab and all their other health-boosting benefits. Belly fat is a common problem for many of us. It refers to the accumulation of visceral fat around the organs in your abdomen, which results in increased waist size. There are a number of healthy foods that you need to add to your diet, in order to shed belly fat and lose weight. Wash and chop all the veggies into bite size pieces. Transfer the chopped veggies into a bowl and add in tahini sauce, salt, black pepper, and lemon juice. Toss everything together very well, and our detox salad is ready to munch on. Enjoy!!! You can add any greens as you like. Eat it throughout the day if you are on GM diet. 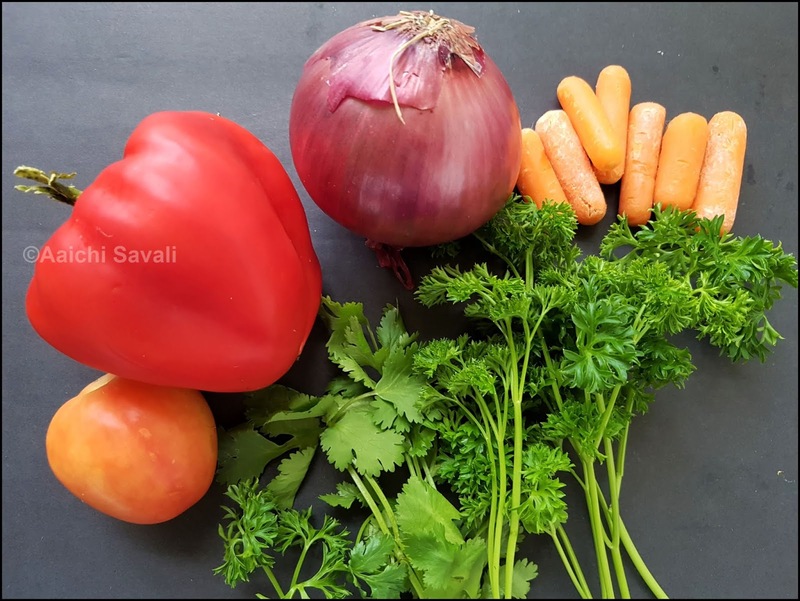 If you are not following any diet plan, then it's good to eat for lunch, snack or for dinner, as it is light, low carb, low calorie and full of nutrients. Addition of tahini sauce is not mandatory, you can serve it with low-fat ranch or hummus or any low-fat sides. 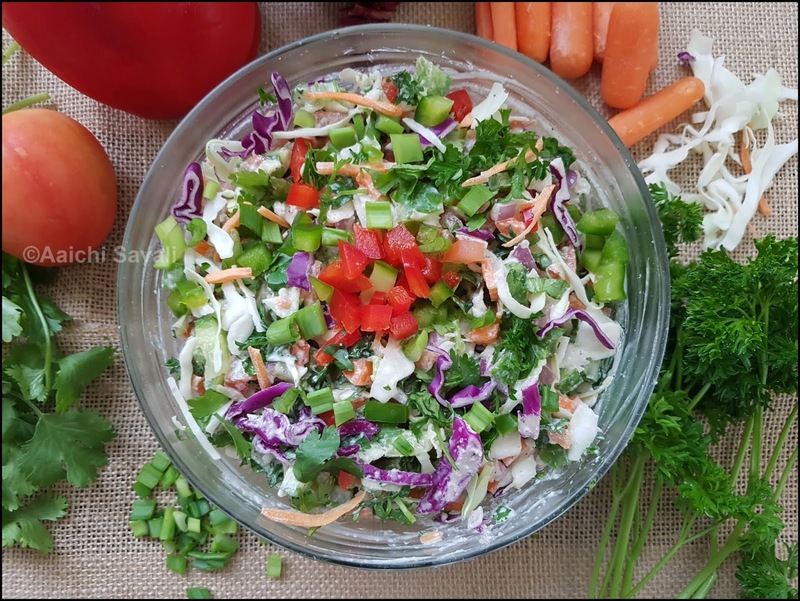 How it helps to lose weight and what are the health benefits of this salad! Cabbage is low in calories and high in fiber content so you will be consuming lesser food and stay full for longer. 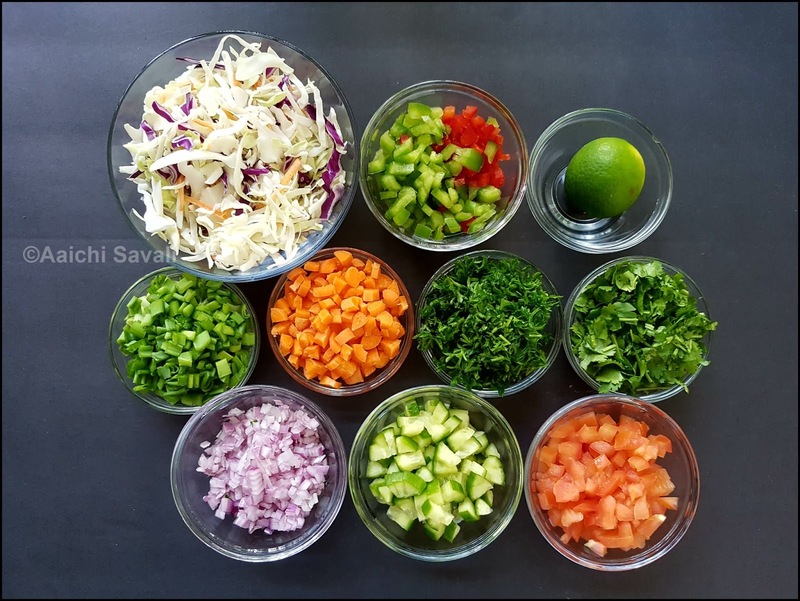 Cabbage can provide you with 50% of your body's daily vitamin C requirement, 100% of vitamin K and a few quantities of magnesium, iron, calcium, potassium and vitamin B6. Cabbage hides a wealth of important nutrients and disease-fighting superpowers. It can help prevent cancer, reduce cholesterol, and heal ulcers. Cucumber has anti-inflammatory and hydrating properties, and that helps to rehydrate the body. It contains vitamin A, B, and C, which has antioxidants properties and that helps for flushing out toxins. The electrolytes in cucumber can reduce water retention. Cucumbers are low in calories and contain a good amount of water and soluble fiber, that make them aiding in weight loss. Cucumbers are a nutritious, refreshing and versatile addition to any diet. Carrots are a great diet food, and they're naturally low in calories and full of nutrients that can help your weight loss efforts. Carrots are a nutritional heavyweight when it comes to vitamin A. Getting more vitamin A might also benefit your health if you have a few pounds to lose. Use carrots to boost your vitamin C intake so you can be sure to get the greatest amount of fat loss from your workouts. Metabolism boosting compound(dihydrocapsiate) and their high vitamin-C content, sweet red and green peppers can help you lose weight. This vegetable is low in calories and contains 0 grams of fat and good supply vitamins and minerals. Their mildly sweet flavor makes green bell peppers versatile enough to include a wide variety of nutritious recipes. Allicin present in spring onions helps to keeps you away from overeating, and it is one of the reason due to which it is very helpful in weight loss. Spring onion lowers the blood sugar level and it support against gastrointestinal problems. It is used as an appetizer as it helps digestion. Parsley is very low in calories but contains many essential nutrients, such as vitamins A, B, C and K and minerals iron and potassium. It is rich in chlorophyll, which improves detoxification and supports weight loss. The enzymes in parsley break down food and release nutrients from the proteins, fats, and carbohydrates you consume, thereby improving digestion and playing an essential role for slimming your body. Parsley acts as a natural diuretic and helps to reduce water retention and bloating. Onions are super low calorie and easy to throw into just about anything, from soups, sandwiches, and tacos to salads, veggie sides, and omelets. Onions are a source of soluble fiber, which makes it a powerful prebiotic food. It ensures a healthy gut, which is crucial for weight loss and belly fat loss. Tomatoes are relatively low in calories and carbohydrates and have high water content, which makes it a perfect bet for those on a calorie-restricted weight loss diet. Tomatoes are plump with antioxidants (lycopene), which may rev up metabolism naturally. Tomatoes are high in fiber. Fiber takes the longest to digest and induce the feeling of fullness. Coriander leaves are a good source of fiber, which promotes weight loss. Coriander stimulates digestive enzymes and juices, which are known to enhance our digestive system and a healthy digestive system is a key to weight loss. It helps fasten metabolism and detoxify the body, which helps eliminate all excess toxins and help you feel light and contribute to weight loss. Lemon support weight control, heart health, and digestive health. Lemons are a good source of vitamin C, and it reduces the risk of heart disease and stroke. Citric acid found in lemon and citrus food may help to prevent kidney stones by increasing urine volume and urine pH. Soluble fiber found in lemons can improve gut health. Lemon helps to prevent anemia by improving the absorption of iron from foods. It makes 5 servings, and calorie count is based on a 2000 calorie diet. Per serving contains 50 calories, along with 8 g carbohydrates, 2.63 g dietary fiber, 1.81 g fats, and 2 g protein along with vit.A-24, vit.C- 48, bit. K- 115, iron - 9 and magnesium - 7 g.
So guys, do try it and I would love to hear back the results from you!